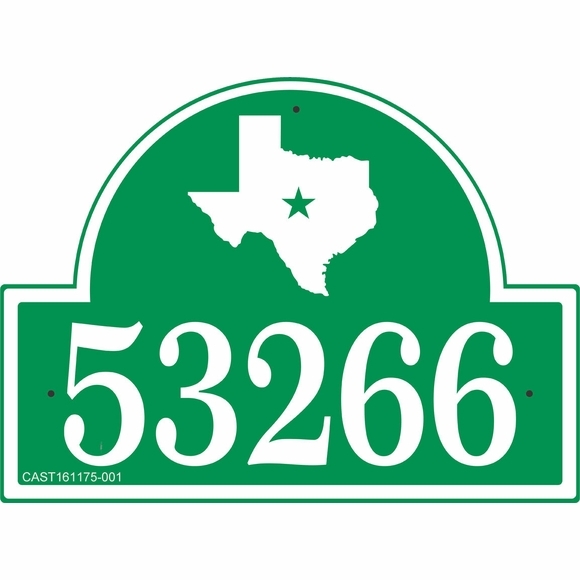 Personalized Texas Address Plaque - - arch shape address sign displays the state of Texas complete with Lone Star above the address. Wall mount. Made in USA. Sturdy, UV-stabilized laminated acrylic construction with engraved personalization. This arch sign can be set up with a one-line or two-line address. A one-line sign holds up to five (5) 4" numbers or eight (8) 3.5" numbers. A two-line sign holds up to five (5) 3.5" characters on Line 1 and twelve (12) 1.5" characters on Line 2. Note: the style number in the lower left on the sample signs is for internal use only and is not on your personalized sign. Engraved state of Texas image, characters, and border are all the same color. Lone Star matches the background color. Personalized Texas address plaques crafted in the USA by skilled artisans to assure the highest quality. If you are looking for a state address sign for any other state, please contact us for a quotation.